HP LaserJet 3320 printer is perfect for home users. 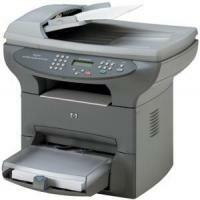 This multi function laser printer provides quality printouts and allows you to produce realistic and impressive images. The design of HP LaserJet 3320 printer is simple with pleasing curves. It comes with grey finish colour. The device has a control panel with grey colour buttons on a dark grey background and an LCD screen which displays the relevant information about the selected button’s functions. The maximum printing and copying resolution is 1,200 x 1,200 dpi with the print speed up to 14 ppm. It has the ability to handle various media types such as envelopes, labels, transparencies, matte paper and glossy paper. The input tray can store up to 250 sheets of paper and the output tray can handle up to 125 sheets of paper. The device has 32 MB of RAM storage. HP LaserJet 3320 weighs. 16 kg having 546 x 495 x 521 mm respectively. HP LaserJet 3320 multifunction laser printer produces impressive print results, easy to use and also has a user friendly interface. Due to its high cost and single colour HP LaserJet 3320 toner cartridge, it increases the running cost of the printer when you have a large printing job on the go. However, as a home printer HP LaserJet 3320 is a good choice. How to fix print quality issue of your HP LaserJet 3320 printer? Check the toner supply to your HP LaserJet 3320 toner cartridges, if found low. See manual for installing new HP LaserJet cartridges for more information. The media might not meet Hewlett-Packard’s media specifications (for example, the media is too moist or too rough). See Product media specifications for more information. If the whole page is light, the print density adjustment is too light or EconoMode might be turned on. Adjust the print density and disable EconoMode in the printer properties. See Saving toner for more information. The fuser temperature might be too low. Check Optimize for: in the Paper tab of your printer driver, and make sure it is set to the appropriate media. See Optimizing print quality for media types for instructions. If toner smears appear on the leading edge of the media, the media guides might found dirty. Wipe the media guides with a dry, lint-free cloth and avoid using harmful solvents which could make the stains permanent. See Cleaning the printer media path from user manual for more information. Check the media type and quality. If the user still getting smeared prints, try installing a new HP LaserJet 3320 toner cartridges by replacing the old one. See instructions for Installing a print cartridge. Make sure that media is loaded properly, one might get wrinkles or creases on the pages, if the paper is not loaded properly in the input trays. See Installing and loading the media input trays for more information. Check the media type and quality. You can refer product media specifications for more information. Open the straight-through output door and try printing straight through to avoid such creases. Turn over the stack of media in the tray. Also, try rotating the media 180° in the input tray. Q. Are compatible HP LaserJet 3320 toner cartridges really cost-effective in nature? A. Yes, these toner cartridges are very cost-effective. In fact, it is one of the highlights of these cartridges that they are very reasonably priced and also provide high yield of best quality results. Q. Is the quality of printouts produced by toner cartridges better than that of ink cartridges? A. Yes, the overall quality of printouts you get by using toner cartridges is in some ways better than that of ink cartridges. The quality of images and print you get is also better than ink cartridges when compared to toner ones. Also, the speed of laser printers (which use only toner cartridges) is better, and require lesser number of refills as compared to inkjet printers. Cost-wise, though inkjet printers are inexpensive at the outset, in the long run, toner cartridges overtake them. Q. Is it okay if I left new HP LaserJet 3320 toner cartridges to remain outside the box for some time while installing them or should they remain covered? A. You need to protect the toner cartridges from light and dust, so it is recommended to install them immediately and avoid taking a chance by keeping them open even for a few moments. Q. I want to try printing with compatible HP LaserJet 3320 toner cartridges. But want to make sure that the quality will be same as that of the original brand and that the warranty of my printer won’t be invalidated. A. You can trust the compatible cartridges and be sure of getting results that won’t be slighter in any way. Also, using compatible cartridges does not pose any risk to your printer warranty. All you have to do is to be very careful about accepting unusual terms and conditions that may come up on your screen as the manufacturers tend to do that to dissuade you from using compatible ink cartridges in order to protect their business interests. Q. I want to buy toner cartridges for HP LaserJet 3320 printer as the old ones run out. I want to know that apart from the price difference, is there any difference in the print quality and page yield when I use compatible HP LaserJet 3320 toner cartridges for my HP LaserJet 3320 printer? A. In comparison to the genuine cartridges, there is no significant difference in the page yield or the print quality of compatible HP LaserJet 3320 toner cartridges. These cartridges have the same performance as the genuine cartridges. All of our compatible toner cartridges are tested to the highest quality standards to ensure these cartridges give you the same high-quality printouts and page yield as the original cartridge. Our premium brand compatible cartridges are available with a money back guarantee so that you can always claim your money back if you do encounter any problems using them. Q. I have recently installed the compatible HP LaserJet 3320 toner cartridges in my printer. But the printer is giving the error message “Door Open or no Print cartridge”. I don’t know how to resolve this problem. Please guide. Thanks. First, make sure you have correctly loaded the HP LaserJet 3320 toner cartridge into your printer. Carefully check the model number of the cartridge installed in your machine. For instructions on loading the print cartridge, please refer “To install a print cartridge” from user guide of your HP LaserJet 3320 printer. After checking the print cartridge, close the print cartridge door securely. When the problem is solved, the product either completes the current job or returns to its Ready state. Q. Does the HP LaserJet 3320 printer supports different media types? A. Yes, the HP LaserJet 1000 printer supports different media types such as cards, envelopes, labels, plain paper, transparencies.